Soft cover book by author Ben Williams. Book size is 4.5" x 6.5" with 160 pages. 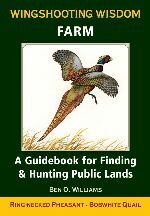 There are hundreds of thousands of acres of public lands in America's heartland available to pheasant and quail hunters. That's the good news. The bad news is that without an understanding of the birds' habitat requirements and behavior, as well as region-by-region population densities, hunters can waste a lot of booth leather finding them. This guide, the first in the "Wingshooting Wisdom" series, includes seasoned advice, maps, artwork and full-color photography of birds and habitats, up to date contacts and accommodations, and everything else needed to plan a successful hunt. Ben O. Williams is an award-winning writer and renowned hunter and dog trainer. His past books include Hunting the Quails of North America; Bird Dog: The Instinctive Training Method; and Winston: The Life of a Gun Dog.